Stow Maries - the second word is pronounced to rhyme with 'car ease' - itself is a disappointing village, mostly bungalows and hideous ranch-style villas, but out on the edge of it is an utterly enchanting little church overlooking a steep bluff, with all south-east Essex spread out below. It was breathtaking - being Essex, there wasn't much to see in the wide plain below, but as I stood there (and I kid you not) four early monoplanes in bright colours flew in formation across the valley. I've no idea where they came from, an airshow presumably, but having just come from the remains of the old Stow Maries RFC station it was an atmospheric moment. I turned back to the church. 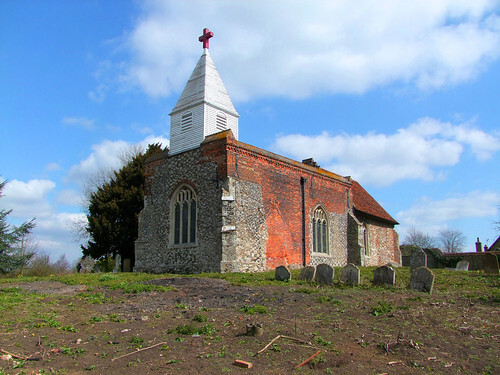 A typical Essex rural church with a bellcote and little nave, but a large chancel tacked on as a 15th Century afterthought. A sign on the door said Peace and quiet await within which was nice. Another sign said this church is always open. I stepped in to a delightful anglo-catholic interior, very simple with its statues. The building has sunk so that the benches slope down from the middle to the outside walls, as at Welney in Norfolk, although rather more dramatically as the church is so little. It is absolutely delightful. A notice on the inside of the door said most of us need an open church at some time in our lives. Next, I was heading down to the Crouch estuary, and it hadn't occured to me that the road my tiny lane would shoot me out onto was the main road between Burnham-on-Crouch and the rest of the world. I was only on it for a mile or so, but it was a relief to get off into my stop, North Fambridge.